Whether you're an artist, and art aficionado, or just an art hobbyist, you know there is art inspiration everywhere around us. 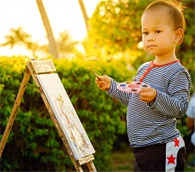 Sharing our passion for art can leave a big impression on our nieces and nephews; we never know what will inspire them to be who they are meant to be and maybe your little "art-venture" will be the thing! We're starting with the obvious: a visit to an art museum. Many cities have several to choose from, so showing nieces and nephews a few to choose from online, and picking out the exhibits they are most interested in is a good idea before you start. A good choice many be an interactive museum like Artechouse in Washington D.C. And check out this excellent article by mykidsadventure.com for tips on how to make the most of your trip to a gallery or museum. Before you decide on a specific craft, take your nieces and nephews to a craft store where the options are as limitless as their imagination. Craft stores offer the opportunity to try something completely new and out of their comfort zones. And hey, it's art. They really can't go wrong! Some craft stores offer classes and other interactive crafty programs. Go on a walk with the kids direct them take pictures of what they want. Capture nature, architecture and people interacting. Get different angles and don’t be afraid to get a little dirty for the perfect shot! Add their photos to a special online album - or better yet, print them out and make a mosaic framed story of your day together. With their beautiful skyscrapers, cities are perfect for discovering unique and peculiar buildings. Architecture can show a new perspective of art in a mathematical and structural light. Check out this helpful article in Allure (yes, Allure!) for ways to truly appreciate the architecture of buildings around you when you're all together. Some art studios offer the option of a class for adults and children, like at the Children’s Museum of the Arts in New York City. This studio offers a family class on Saturday, so you can work hard and play hard. If you can’t find a class in your area, or you're stuck inside, try YouTube tutorials. From sketching cartoons to oil painting flowers there’s definitely a video that will spark your nieces' and nephews' interests.